Knowing the proper trail etiquette is important when trail riding on horseback in order to keep it safe and enjoyable for everyone. 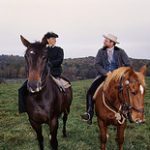 It might appear that everyone simply mounts up and rides off into the woods, but there are actually many unwritten rules and customs that trail riders follow. Although the rules are relaxed somewhat among small groups of friends, these are the generally accepted standards when the ride consists of a large group of riders who may not know each other well. 1. Never pass the lead rider (the trail boss), and never fall behind the last rider (the drag rider). These two positions are designated, and all other riders in the group stay in position according to their horses’ abilities. Some horses are more comfortable in lead-horse positions near the head of the line, while other horses feel more comfortable as followers near the end. Horses that are “buddies” should be kept together, generally near the end of the line. 2. Always ride single-file, with at least one horse-length between horses. Not only is it considered rude to tailgate, it’s also dangerous if the horse in front kicks, spooks or stops suddenly. The single-file rule can be relaxed somewhat when riding in open areas, with horses two or three abreast. However, it’s best to avoid forming groups, especially if the riders must form a line again when picking up a trail. Even if the line breaks, it’s still important not to pass the lead rider or to fall behind. Also, never stray away from the group or leave the trail. 3. The lead rider calls the gait. While walking is the default gait, the lead rider may ask the others to jog or trot when it is safe to do so and the trail footing allows. Changing gaits without permission is a breach of etiquette. Never spontaneously lope, canter or gallop. In addition to being rude, it can cause other horses to start running to keep up with the herd. 4. All riders keep to the level of the least experienced rider. If there is someone in the group who is uncomfortable controlling their horse at the trot, going over bridges or through water, plan to avoid these obstacles. Trail riding is not the time to push a rider (or a horse) past their limits. Safety and consideration for the least experienced in the group is the rule in trail riding. 5. If a rider falls off the horse or dismounts, all riders in the group stop. If it occurs near the end of the line, the riders at the rear notify the riders ahead. No one proceeds until the rider is safely remounted and signals that he or she is ready to continue. Likewise, if a rider needs to dismount, for instance, to adjust tack or retrieve something from the ground, the proper procedure is to notify the rest of the group before doing so. A rider should wait until the group has stopped before dismounting, and notify the group when ready to resume. 6. If a horse spooks or bolts, or the rider is having trouble controlling his horse, the group stops until the horse is under control. When a horse becomes scared, other horses moving around him are distracting and can make him even more nervous and panicked. As prey animals, horses take their cues from other horses, and the flight instinct takes hold. Keeping other horses calm and quiet helps a horse get over its fear of the foreign objects and different sounds on the trail. 7. Respect property owners and other trail users. If the ride takes place on private property, do not carve new trails, trample crops, or disturb livestock. Pass through respectfully, don’t litter, and don’t trespass. Yield the right-of-way as directed by the trail boss. The trail boss has the prerogative to issue his or her own rules differently or in addition to these rules. In that case, the trail boss’s direction takes priority. Following the lead rider’s directions, being courteous and helpful to other riders and respecting property owners are the keys to a safe and enjoyable trail ride.